So it seems clear that the ECB and SNB are using their citizens' reserves to play FX:XAU in partnership mode right now. An emergent gold bull against the world's second biggest currency must be beaten back into its cage. I read these comics as a kid, I guess at about 7 or 8. There was Captain Marvel, Captain Marvel Jr. and Mary Marvel. Captain Marvel first appeared in Whiz comics dated Feb. 1940. As it happened Superman first appeared in Action Comics dated June 1938. The creation of the Marvel Universe apparently was not different from the Superman Universe. "National Comics Publications v. Fawcett Publications, 191 F.2d 594 (2d Cir. 1951). was a decision by the United States Court of Appeals for the Second Circuit in a twelve-year legal battle between National Comics (also known as Detective Comics and DC Comics) and the Fawcett Comics division of Fawcett Publications, concerning Fawcett's Captain Marvel character being an infringement on the copyright of National's Superman comic book character. The litigation is notable as one of the longest-running legal battles in comic book publication history. The suit resulted in the dissolution of Fawcett Comics and the cancellation of all of its superhero-related publications, including those featuring Captain Marvel and related characters. In the 1970s, National, rebranded as DC Comics, licensed the rights to Captain Marvel and revived the character. DC Comics then purchased the rights completely by 1991." "In 2009, The Walt Disney Company acquired Marvel Entertainment for US$4 billion; it has been a limited liability company (LLC) since then. For financial reporting purposes, Marvel is primarily reported as part of Disney's Consumer Products segment ever since Marvel Studios' reorganization into Walt Disney Studios." My neighbour is a set designer. Recently she said she was working out of town, apparently on the "Supergirl" TV series. I said I never watch it and neither does she. According to her the demographic is men from teens to 35. That figures since I saw the original "Superman" movie in 1978 as I transited out of that demographic. Unfortunately silence is sometimes the pragmatic choice since Canada, like Europe, does not enjoy free speech since the hate laws were passed. The hate laws where the government and courts define hate speech. This week I read "A Higher Loyalty, Truth, Lies and Leadership" by a former FBI director. Well written, good read, from his days of prosecuting the mafia to his days as FBI director. Two things stand out, he characterizes DJT's leadership style as similar to that he saw in the mafia (loyalty) similar to what Michael Cohen has been saying this week. Secondly, one wonders about this guy's leadership. Did he not know what was going on at his agency or did he simply choose to omit all that stuff? 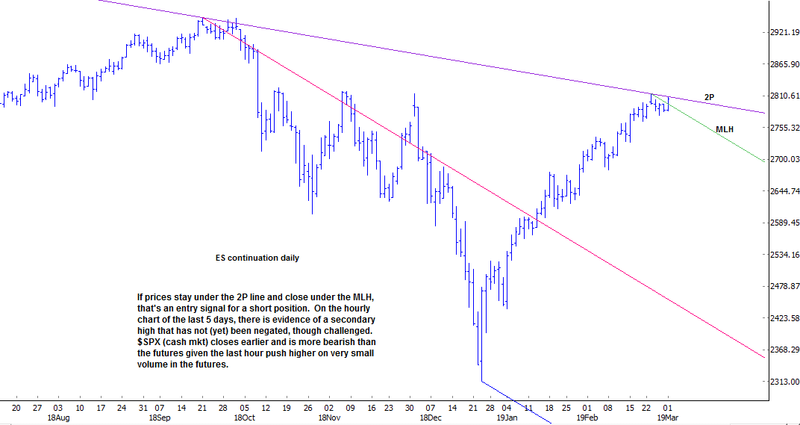 The ES daily shows that further immediate downside is still not a far-fetched possibility; and the hourly chart gives further evidence of this as Friday's high was made on the 60m R1 line from Monday's high. But, if Friday's high were taken out on any hourly close, odds of a top last week would drop substantially; if last Monday's high is exceeded at all, prices will probably move higher still. So Sunday evening weakness in the futures, such as a lower close in the first hour, preferably on a reversal-type bar and under the r1 line (now a possible hourly mlh itself), could provide a low risk short opportunity in this market. 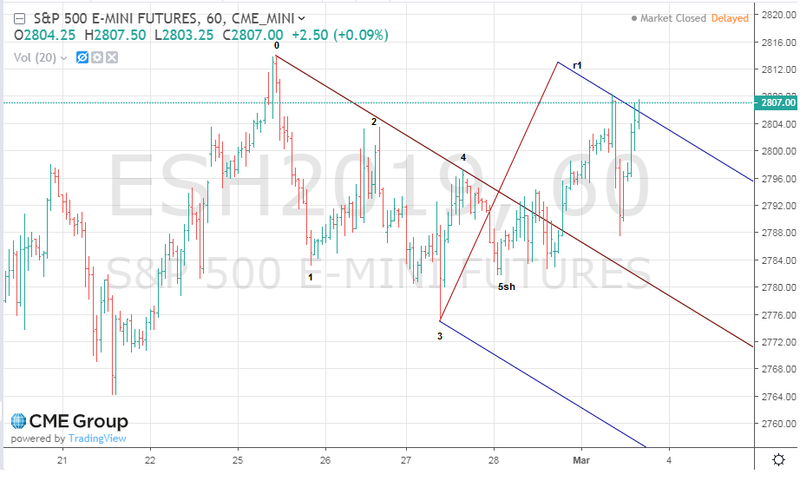 Also, often within 2 hours of the cash market opening, the futures price action gives a signal by closing below a key line on the hourly chart. This may happen if prices meandered during the Sunday evening trade. What happens next is a probable drop to the R1 line of this well-defined channel move on the daily, where even the action line is virtually mpl. So support at the R1 line (assuming price gets there) should be stout, and it would be supportive for a low at/near R1 if we had at least 1 pair of m0 daily pivots in place, and preferably two. Maybe 5 m3 ps will appear on the intraday chart, maybe on the 4hr. 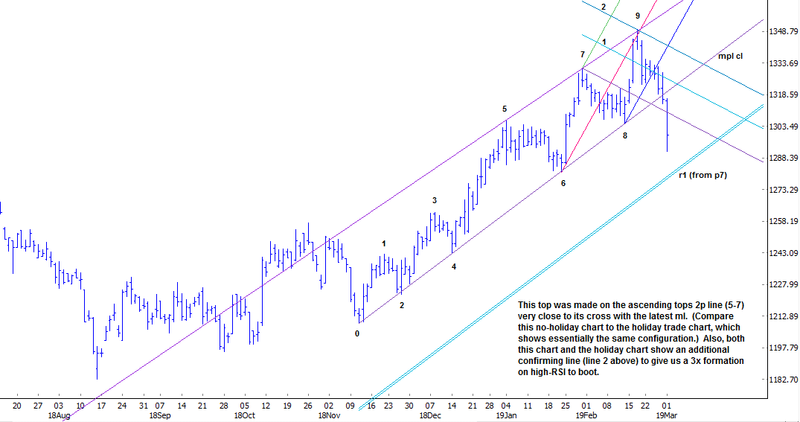 The charts, daily and 4hr, show the geometric and other factors in play at the recent high. Do SJWs always double down as Vox Day says in his book? You yourself can be the judge. .... and .... pass it on ! Remember, when the crazy left go full retard on mainstream things, mainstream people can then see their work. All you have to do is say "What is that all about?" And let them begin the slow process of peeling their own layers of intellectual encasement away at their own pace. Naturally, only if they wish to do so. It is a free world after all. And that's why there is usually somebody willing to take the other side of a good trade. I am not pointing the finger at Youtube in this. And not necessarily pointing it at Disney either. The person making the above video has used loose reasoning to think Disney contacted Youtube. It's possible. But far more likely is that activist SJW people have flagged his video to get it demonetized, because they are rooting for neo-feminist marxism. Multiple flag reports would result in a video being demonetized until after a manual review was made. Good evening, long time no see. I've been very busy the last month. Hopefully March is much more relaxing, I need it. Swapped page in my nuclear calendar, the nice lady Uranus is gone and replaced by a boring picture of a control room. I noticed a display showing a date 23 days into the future, the 27th of March. I first thought it was of no significance, but on the morning news the reporter told me the deadline for the USA-China trade deal is 27th of March. It's a Tuesday. Tuesday is the Mars day. At that time we are in Aries, a sign of fire that is ruled by Mars. March in Swedish is Mars, so we got a triple Mars relationship the 27th, interesting. Yes, the stock markets around the globe continue to go higher DESPITE weaker economic data, but that's exactly what investors want today. Yes, TPTB injected over $3 trillion into the stock markets, but what did the bears think was going to happen if we had even a slight correction? I have news for the bears, $3 trillion is nothing compared to what they're going to do down the road, so stop complaining about how unfair it is and how it can't work going forward. They have no other choice. And no, injecting money into the stock markets is NOT inflationary or gold positive because very few people hold most of the stock assets around the world. It's basically a risk free policy for central bankers, they would be stupid not to continue. BTW, there's going to be near $1 trillion in share buybacks this year, we should be seeing all-time highs in the US stock markets by mid-year. When that happens, gold will likely be breaking down once again. Throw away all your technical analysis books and just trade Trump tweets and Goldman signals. Bet you beat the crowd. Bankers celebrating golds approaching rise while US military celebrating an SWJ, I mean patriotic infused cinema for all Americans' to see. Just because I'm paranoid, doesn't mean they aren't out to get me. Audience scores at this early stage are not agreeing with gushing approval from Disney-bot-press-critics scores. This IS reflective of the same conflict in monetary matters. Watch gold against that EUR breakout. Stocks will likely follow gold. Bonds must confirm. A double check at https://www.metacritic.com/movie/captain-marvel shows a score of 65% at the moment. Because Alita Battle Angel's maker is 20th Century Fox, it is still ultimately owned by Disney, since the takeover of Fox, so they are both products from the same overall ownership. I am reminded of Don King during the Rumble in The Jungle. Ten million bucks from the govt of Zaire, for promoting a bout where his fighters fought against his fighters. His commissions must have been astronomical. Quite the interesting fellow, King was. Not admirable, but fascinating. Take a look at the first chart, compared to the ones below it. The activists are giving 10s, and the critics of intolerant neo-feminism giving it a 1, with a bell curve of normie "don't care/unaware/enjoying life but being influenced" clearly visible in-between the two other "woke" groups. It's instructive, since this is likely a universal structure for politically divided issues of all kinds. So the next time you consider a trade, have a little internal moment to decide if you are on one edge, the other edge (you have been "mentally recruited!) or in the middle. The profitable trade is being located in such a place that the middle bell curve moves towards your position, taking price with it. GLD has nothing to do with what is occurring in Captain Marvel. So people think. And if that is the case then why did I zoom in on StarWars The Last Jedi? I didn't pay attention before that, though I have been posting here for years. So what did I see to make me begin talking about movies? What do you see? What have you seen after I began talking about movies? Where is the connection with the core purpose of this forum, Setup For The Big Trade? Did you notice this relationship? I have edited and adjusted scales to make something obvious. We all know that price history pretty well, right? In the movie it is the racist-sexist-neofeminist-Hollywood "woke" and their followers giving it a ten. The people aware of what's going on are moving to the other side to defend a sure result against their interests are giving it a one to cancel out the SJW-neo-feminist social control attack. And the oblivious normies are in the bell curve in the middle, being shepherded around as they simply look for a good time and entertaining movie while avoiding having to think too much about what's below the surface. Now let's move away from the movie industry and social justice and look instead over at the financial industry and big politics. In the GLD fund it is the financially "woke" selling high, their political partner-follower-allies doing trades alongside them. The industry recognize prices being deflected to extreme value and are buying low, and they have followers too. And the "investing public" are trying to trade in the middle, where future direction of price is most random and the next price move can be easily in either direction. And professionals just don't attempt that. Which is why I spend a lot of time not buying or selling, but I am more often awaiting the market to present me with a better opportunity of a big move and better odds of success. And I can see clearly where the big influencers are willing (or compelled) to act, but it is a moving target, the best information is lagging, and that means this game will never be easy. As for the news? Price tells where and when the next news burst (newsflow surge) will appear. Awesome piece of cycle work!! Nobody else in this field is taking it this far and pealing back the layers in this fashion. 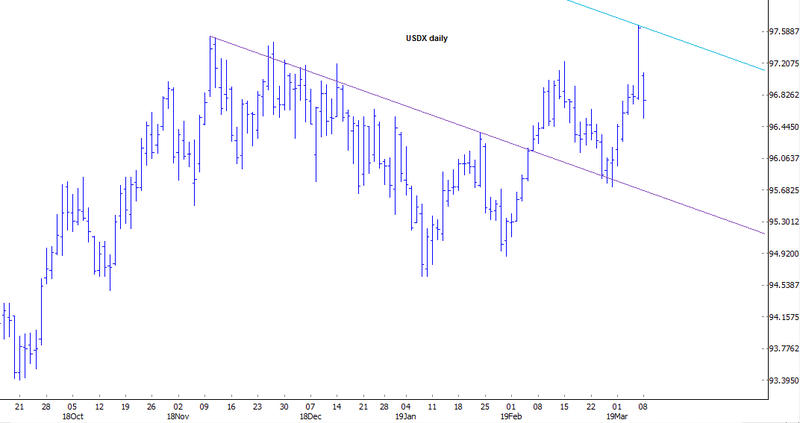 I wondered what in market geometry might account for the unexpected, sudden reversal in the dollar on Friday. The daily chart shows a maze of different min-size pivots, and it's difficult to see the forest for the trees there. Usually it helps to "take a step back" for greater clarity, so I looked at the weekly chart. There are only a few m0 pivots on the recent weekly, and if you use those weekly m0 ps on the daily, you see this. 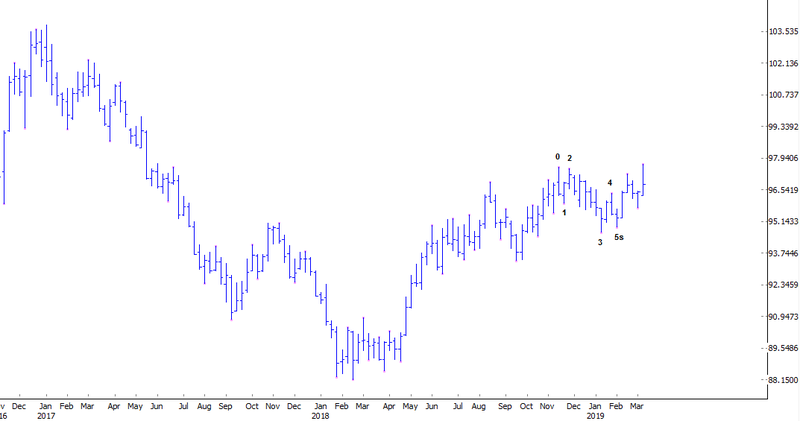 The last pivot low at/near the 0-4 cl strengthens R1 as resistance. Plus, there are 5 ps to the R1 line. Perhaps this R1 will stop the advance, or it's just a temporary, dramatic reversal. It could take the dollar back to the January lows. The bullish case comes from another perspective, this 2nd H bounce pattern, from which the market duly launched higher over the past week. We'll see which pattern prevails. What of known events soon to occur? Such as implementation of Basel III rules on March 29, 2019? But the report by Il Sole / 24 Ore may give reason for advocates of limited and accountable government, free and transparent markets, and fair dealing among the nations some reason to stick around for another three weeks." As of now, the rules do not recognize gold as being on a par, for reserve purposes, with cash or government securities. As of March 29th, gold will be a top tier reserve asset for banks. Is this why governments have been on a gold buying spree the last few years (China much longer)? 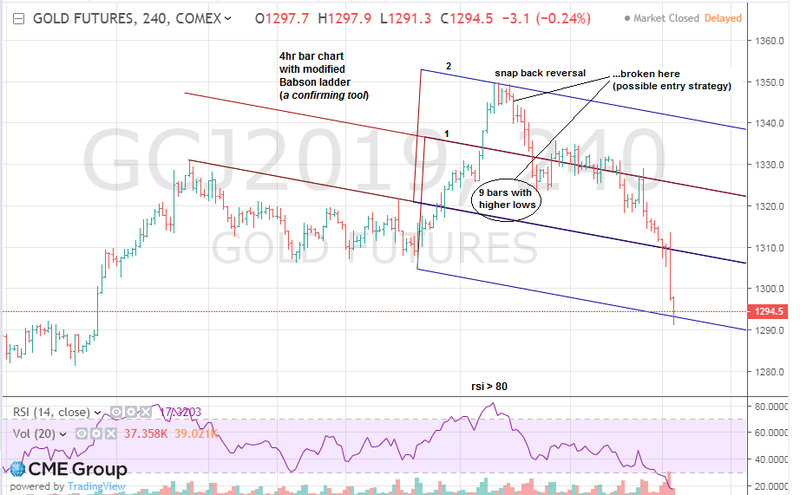 What effect on gold prices, if any, might be expected due to this change? It certainly would appear to be a change resulting positively for gold prices. However, many other things have transpired that should give similar results, but price suppression through futures markets, etc. have overcome them all. Maybe this time, the banks are ready to allow gold prices to rise. Beating gold back might not be as difficult as it appears. 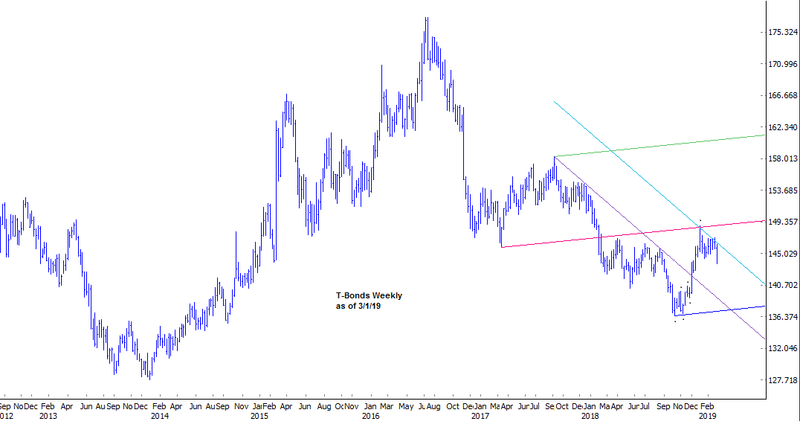 EURUSD looks as if it is breaking down, this could very well catalyze a dollar bull run that will squeeze many in emerging markets. Personally I'm very skeptical of the scenario where all of China, who are supposedly buying gold, is the smart money. I expect them (or the western central banks) to get squeezed before we can go up. Approx. 12 week cycle in the dollar. June-Sept 17. 12 weeks to low. Feb 18 2nd bottom. 6 week retested the low again. 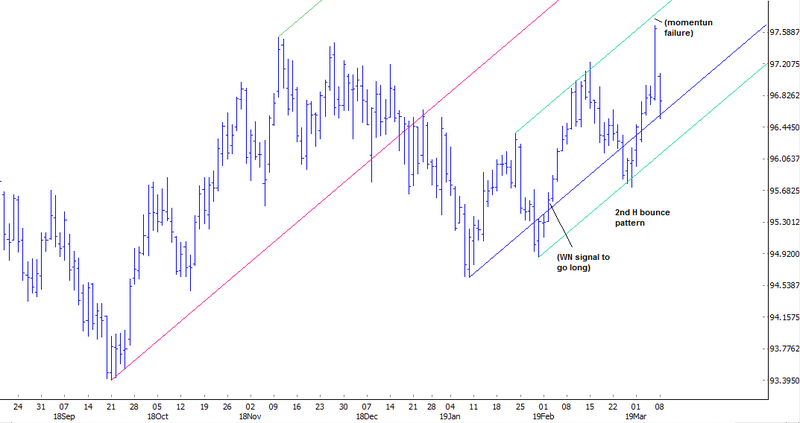 Dollar rallied approx. 12 weeks. Climbed again 12 weeks into December. 12 weeks later and here we are. Times up...for now. If Gold stays above 1280 on the week, it could make it's next advance. Approx, 29 week rallies, low to high (2016), and bottoming going on. 29-week rally into late-Jan. 18 and you can find the rest. It looks like we have a new pattern forming to begin the next cycle? Also, Gold has now declined to test the Fibonacci 38.2% retracement of the August 2018 - Feb 2019 move.Which begs the question, what else should I be looking, that he's looking at, if I an thinking about trading gold? Price of silver and gold are diverging. Not positive for silver (as far as I can see) Silver got it's own codex and hidden secrets that studying gold doesn't reveal. The crying about how well the stock index's are doing while gold is going down will ease for a little while as the intermediate trend changes the movie script. Looks like the index's are peaking in a kind of sequence. New Moon falls zero degrees conjunct (next to) NYSE co-ruler Neptune and within 7 degrees of the natal Mid-Heaven point of the NYSE (24 Pisces). this lunar cycle runs till April 5. I exited all stock trades. If this is all Greek to you, here is a good video of most of the fundamental astronomy you need to understand to time the market.